Despite my enthusiasm for consuming potentially inappropriate quantities of it, pizza was not the reason for visiting its birthplace of Naples. In keeping with my recent theme, in fact, the purpose of visiting Naples wasn’t actually Naples itself, as such: it was Pompeii and Herculaneum, and the cause of their interment, Mt Vesuvius. Mt Vesuvius itself, as we’d anticipated, was just another quiet crater atop just another mountain – albeit one worth visiting just for the sake of having done so. We spent a while at its summit (well, as close as they’ll let you get to its summit) trying to make out Pompeii and Herculaneum from next to the souvenir stand – with mixed success. (We eventually confirmed that we’d figured out roughly the right spots, but that not much is actually clearly seen from the mountain.) Other than that, our entertainment mostly came from observing the sometimes valiant, more often not, struggles of many a not-so-intrepid tour group adventurer attempting to make it up to the crater from the carpark in the first place. The excavations at both sites are fascinating. The scale of Pompeii (which we happily explored for a full day) is as captivating as the detail of the incredibly well-preserved remains of such a large proportion of Herculaneum. 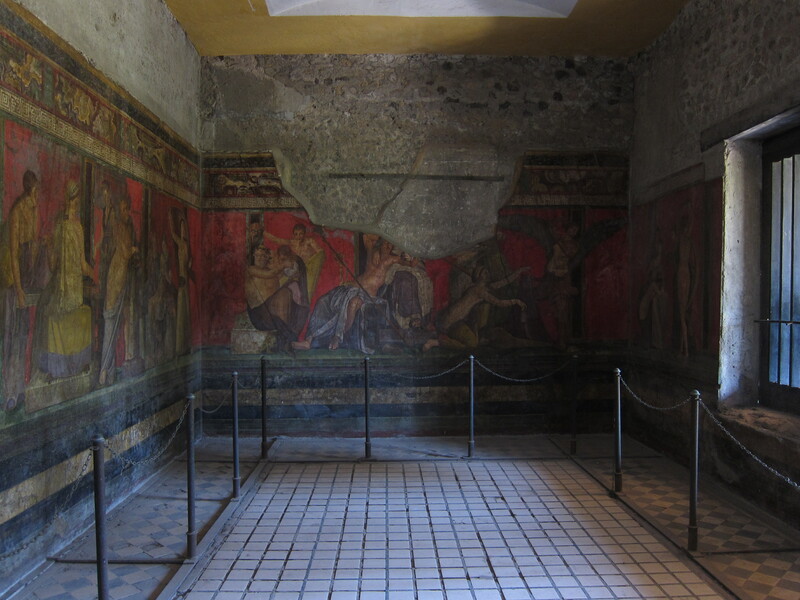 In Pompeii, you visit everything you would expect of a large, thriving Roman city: a forum, temples, bars, a brothel. 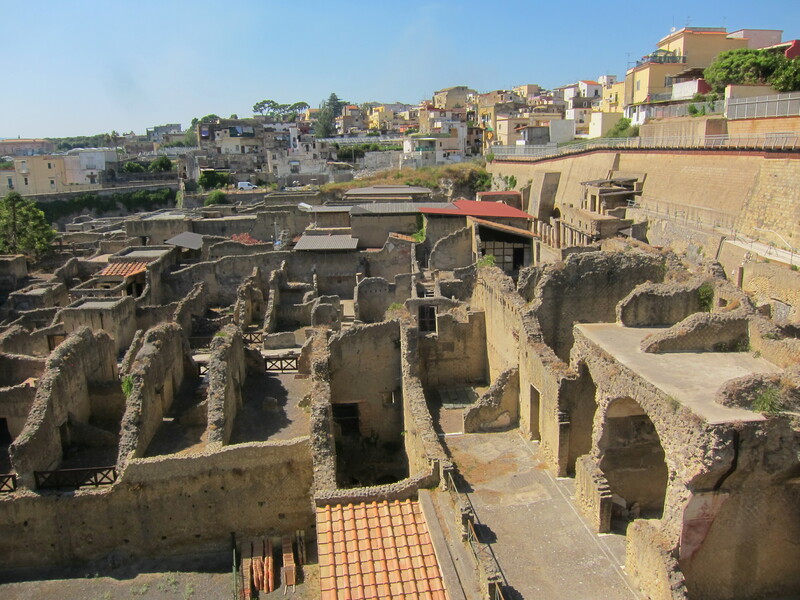 Herculaneum, closer to the volcano and a much smaller city, has what for modern visitors, if not for its original inhabitants, is the benefit of having been less devastated by the initial eruption, but more thoroughly enveloped in boiling mud in the aftermath. Thus the incredible state of Herculaneum’s preservation in parts: the muddy entombment being enough to prevent wood from rotting, or buildings from falling down, or frescos from eroding away. 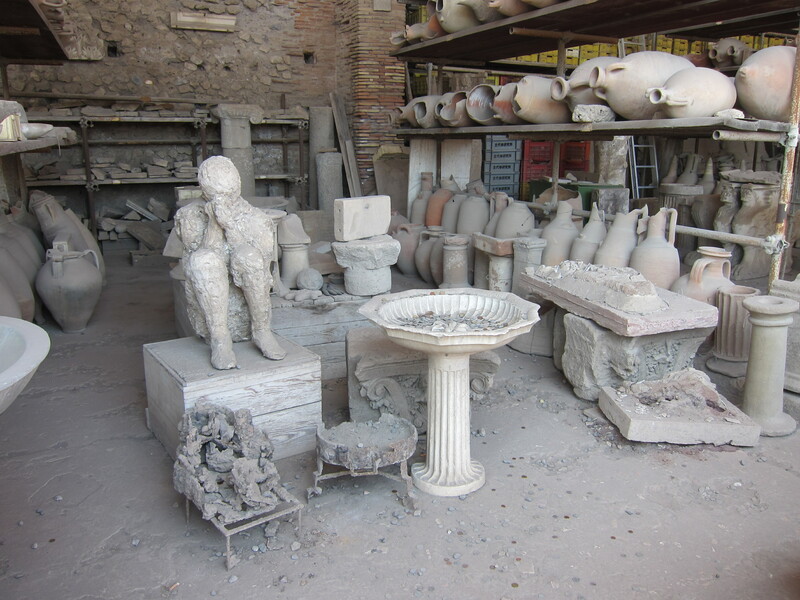 The signature dish at Pompeii, I suppose, is the plaster cast bodies. When the hot mud and ash flowed through after the eruption, covering the bodies of those who didn’t make it out, it solidified around their remains. Corpses being corpses and flesh-liquefying bacteria being flesh-liquefying bacteria, those remains then slowly rotted away, leaving human-shaped cavities in the hardened volcanic mess, and providing a perfect opportunity for some enterprising dudes and dudettes with little hammers to play archaeological Play-Doh nearly two thousand years later. Hey presto, plaster dead guy. But much to the dismay of three American cruise boat travellers who asked us for directions, there aren’t actually many plaster dead guys on site. And to be honest, it’s not that big a loss. There are much more stimulating things to see. 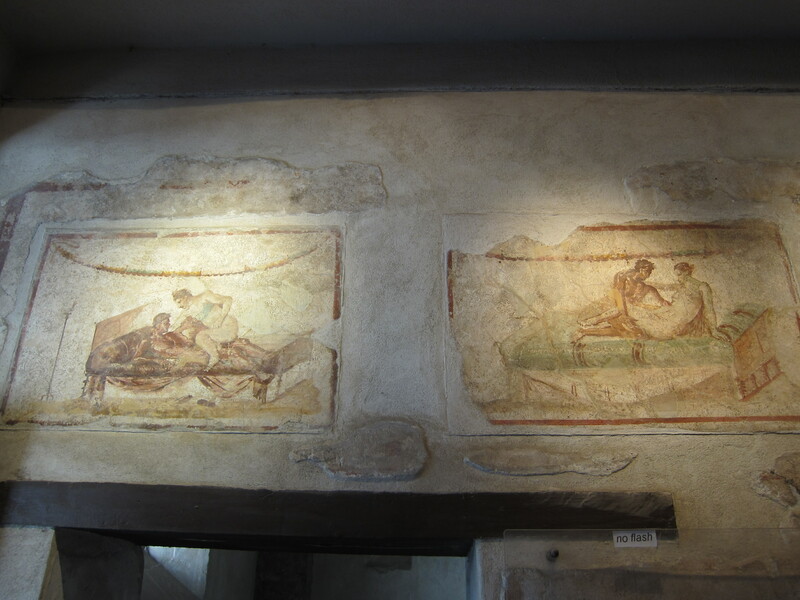 My two biggest highlights, I think, were the baths – there are two major ones, the Forum Baths, which are quite well-preserved and detailed, and the Terme Stabiane, which are larger but have suffered more from the passage of both time and volcanic excreta – and the Villa dei Misteri. The latter is a bit of a walk outside the main city ruins, but is well worth the effort, to see a beautifully decorated large Roman villa largely intact. The painted walls of its dining room are stunning. Of course, in addition to those two highlights, it’s hard to go past having a snicker at the brothel (the Lupanare). 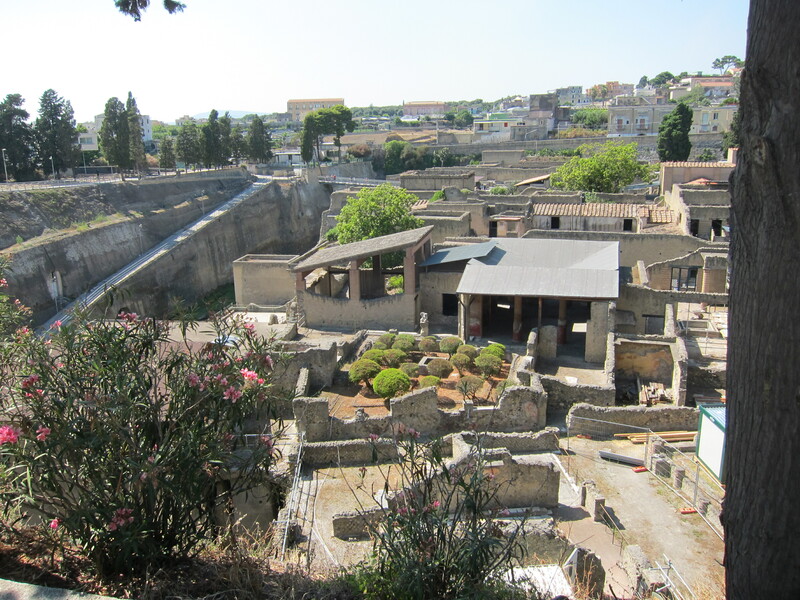 The baths in Herculaneum were a focal point, as in Pompeii – although unfortunately we could only go into the Central Baths: the Suburban Baths, which looked from the outside like they had definite potential, were closed on the day we wandered through. But not to worry, there was plenty else to see. The most interesting feature of the buildings around town was probably the bits of preserved woodwork – covered in hot ash, the wood carbonised rather than slowly rotting away, so a surprising amount of it is still there. 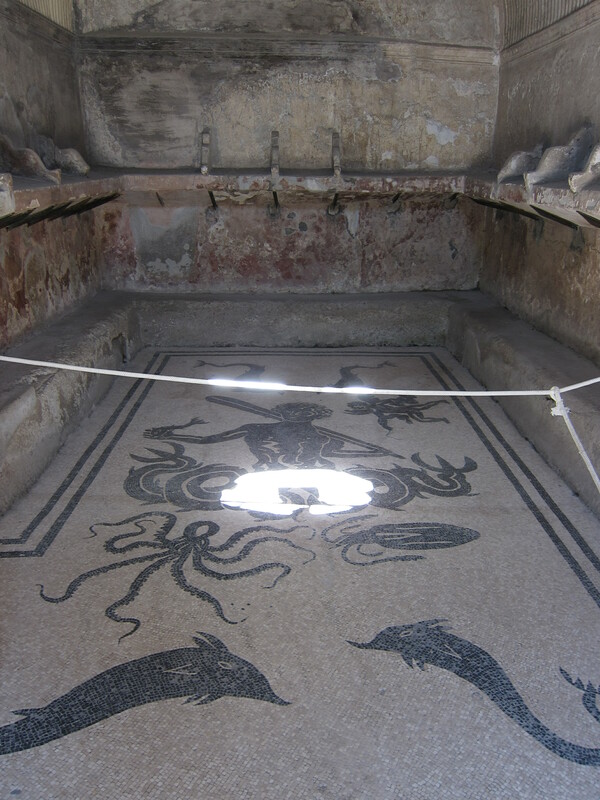 And the mosaics throughout the ruins are incredible. After two days, by the end of our time in Pompeii and Herculaneum, I think it’s probably safe to say we were all ruined out. I’d be lying if I didn’t admit that the last few houses and tavernas in Herculaneum started to look remarkably like the dozens we’d gawked our way through over our two days of exploring already. But the experience of exploring two dead cities was awe-filled and thrilling. And hey, it was good exercise, to boot. Oh, by the way, random tip of the day: unless I completely misunderstood the guy behind the desk (which seems unlikely, because I was just confirming something that I’d been told by another traveller), Pompeii is apparently half price for South Australian students. No idea why, and it’s a long time since I was a student, so I was only half way to meeting the requirement. But there you have it; any fellow South Aussies who are visiting, and who still haven’t made it out of school/uni, archaeology your heart out for a bargain basement €5,50. Finally: thanks and credit to Chris, who doubled as my photographic assistant while my camera was indisposed with a manufacturing defect. All the photos in this blog post are his. Cheers, mate!